Ground Penetrating Radar Systems was recently contacted by a local structural engineering firm to help locate reinforcing steel within multiple joists, beams and floor slabs within a facility in downtown Nashville, Tennessee. 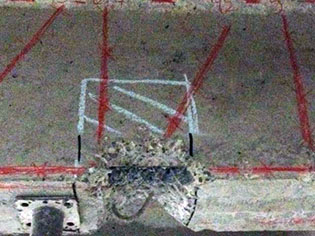 Due to multiple cracks in the elevated concrete slab and other noted issues, the structural company was performing a site investigation and could not trust the as-built drawings which were provided. 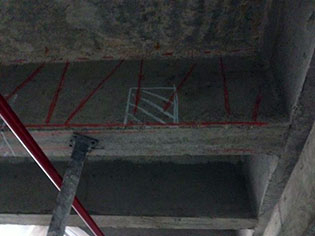 They decided to use concrete imaging provided by GPRS to accomplish this task. At GPRS, we operate with the newest and most innovative GPR equipment; which is completely safe for both our clients and the job site because there is no radiation emitted from the equipment. All of our findings are immediately available to our customers directly in the field and therefore no wait time is required. GPRS can help you locate post-tension cables, rebar, conduits, underground storage tanks and utilities. Please contact Ground Penetrating Radar Systems (GPRS) to learn how we can assist with your next project. Contact your local project manager at matt.johnson@gprsinc.com or (615) 418-4023. Ground Penetrating Radar Systems, LLC. also has offices throughout the states of Tennessee, Arkansas and Mississippi. See our contact page for more information on these offices.